John Westwood was the drummer in one of Chris Barber's earliest amateur bands, and the first one to record. On Thursday 11 October, 1949, John and Chris, along with Hugh Middleton (cornet), Alex Revell (clarinet), Colin Bennett (piano), and Arthur Huxley (banjo), recorded five tunes: Mabel's Dream, Working Man Blues, Doctor Jazz, and two takes of Gatemouth. 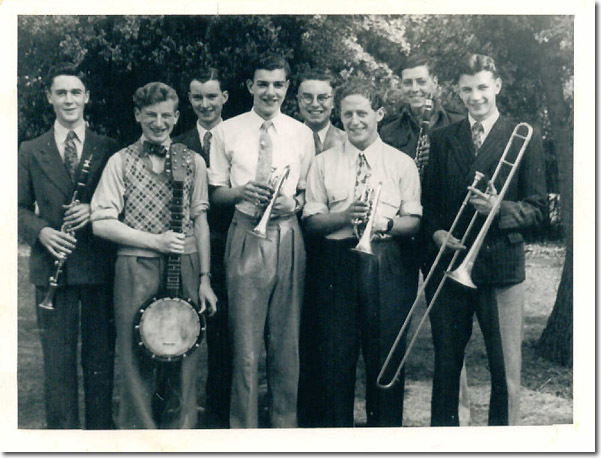 Here John shares his reminiscences of the very earliest days of British traditional jazz. I first met Chris Barber early in 1948. At that time, British Jazz as we know it didn't exist. Really hot music was often played by dance-band sidemen and other professionals, but it wasn't until this latter part of the decade that any real attempt was made to recreate this special music played in the North, South, East and West of the United States. And that attempt was made by enthusiasts who had been inspired by what they heard on gramophone records. Some musically-educated souls knew what they were attempting; others, like me, were still at school and just frightening their parents silly with the strident sounds emanating from the family radiogram. Musical instruments were not difficult to come by. They could often be picked up (along with piles of dusty old records) from the junk shops, pawnshops or second-hand emporia. I believe Chris bought his first trombone for a few pounds from a friend: a not unusual happening. Exceptionally, a doting aunt or other family member could be persuaded to fund the means of making some music – provided they didn't know just what sort of music we were talking about! In July 1948 I was 'called up' to do my National Service. On arrival at the RAF training camp at West Kirby, one of the first persons I saw was Pat Hawes, who had been the Jellyroll Kings' pianist. He was on the parade ground resplendent in a tiger skin, beating the daylights out of a ceremonial bass drum. A few days later I joined that band, but on a very hard-to-play rope-tensioned snare drum, which I never mastered properly! I had a very happy time in the service, saw some interesting places and got to sit-in with some really good emerging bands, like the Smoky City Stompers, Yorkshire Jazz Band and Ray Foxley's Levee Ramblers to name just a few. But towards the end I found myself back in the London area at Fighter Command Headquarters, and with time to get about and play with old and new friends once again. John Haim had, sadly, died in January of 1949 and the band had split up – Gerry forming a new one, and the rest scattered around the area. I spent some time playing with Mike Daniels (and Keith Jary and Brian Baker, who were later to join Chris). It was in the September that I had the chance to join Chris's then newly-formed band. Chris and Alex Revell were firm friends, and another of their pals, Hugh Middleton, played very nice trumpet. Arthur Huxley plonked banjo (and carried the bass drum) and Colin Bennett played piano. I never did find out what subsequently happened to those latter three. This group wasn't together for very long, but on 11th October 1949 we did get into the Modern Messages recording studio up the hill from Swiss Cottage, to cut half a dozen sides – five of which I still have, to remind me just what might have been if I'd been a better drummer, and not afraid to 'turn pro.'! Chris went on to study at the Guildhall School of Music, and after demob, I got a job with Philips Electrical, right at the back of Denmark Street and the Fullado Club, but that's another story! In February of 1950, with Pat Hawes and Alan Morris (ex-Jellyroll Kings' banjo player) I joined Ken Colyer, Sonny Morris, John RT, etc., at the White Hart in Cranford (now several feet under the perimeter track of Heathrow airport!). In April we cut some sides in a small basement studio under one of the Piccadilly arcades – the details now escape me – and again, have a reminder of what might have been. But Ken wasn't happy with those Crane River Jazz Band developments and took ship to study at the roots – all of which has now been properly documented, thank goodness! By that time, however, I had taken the decision to try to carve a career in the world of sales… so I joined a small company (which subsequently came to be part of the GlaxoSmithKline empire – who, fortunately for us, now provide a useful pension!) and worked my way up into sales management. This also gave me the opportunity to travel the country widely, and this time I didn't attempt to play (or get encumbered with the sheer bulk and weight of) a drum kit. Instead, I settled for acquiring some marginally less weighty and bulky tape recording gear with which I managed to record a lot of really good bands who otherwise I couldn't possibly recall today! Sadly (for me), Chris never figured in those, but that's of no matter since his bands have made so many really good recordings which are easily available to us all. In the late 1980s, when we were once again settled in London, my wife Pam pushed me into taking a drumming and percussion course at the local art college – on the local rates, which brought a new meaning to 'state support'! Ever since then I've had the pleasure of playing, at a very amateur level, with a lot of really great jazzers. And now, living on Spain's Costa Blanca, I'm (just) able to load my vintage drums and cymbals into the car to play real jazz with some kindred souls, including the aforementioned Gerry Haim, who lives but a dozen miles down the road from our little Spanish village house. Funny old world, isn't it? John Westwood, Tormos, Alicante, Spain, June 2008. The Stanmore Stompers at Mike Daniels's home in the summer of 1949. John Westwood is third from the left, Keith Jary is fourth, Brian Baker is fifth, and Mike Daniels is sixth. Back to the From The Archives page.